St. Philip’s Episcopal School (SPES) is grounded in the expression of Christianity and operates within the beliefs and traditions of the Episcopal Church. 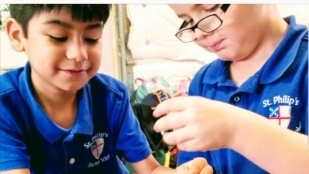 SPES nurtures spiritual growth, exploration, and discovery of self; promotes service and responsibility to others; and provides strong 3K-4th Grade academic programs for motivated and able students of diverse races, creeds, and economic backgrounds, utilizing innovative resources to teach the best of traditional curriculum. I have been Head of School at St. Philip's Episcopal School in Uvalde for the past two years. Before that I was a part of UCISD for 20 years. I am a mother and grandmother to children who have attended both St. Philip's and Uvalde CISD. My hope is to grow our resources for our students at SPES to enable them to be successful no matter where they go from here!